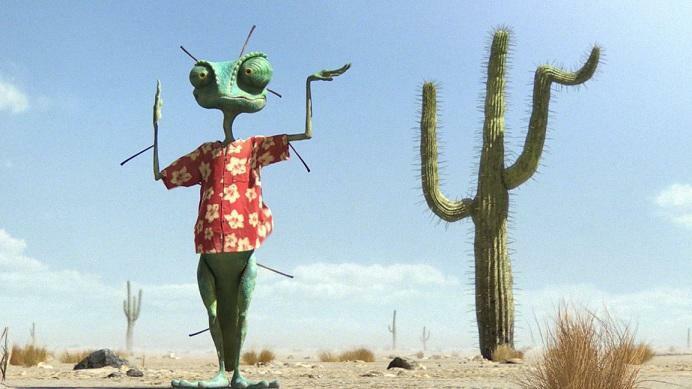 In Rango cliches and stereotypes are mixed togheter and are added colorful dialogues.By the multitude of characters is trying to portray the fierce bandit type, the corrupt mayor, the gunmen scary, big-eyed and naive child , but with smart lines, tough women, which added more “specific” realities of their furry, winged or crawling. Outrageousness surpasses the typology in order not to stay in the mind with some chameleons that are not distinguishable from each other through specific behavior. Dirt city seems a character itself. Artist’s vision “Crash” McCreery brought something new into the look of classic western town.From distance, Dirt city looks like a typical western city, but when you get closer you see that everything is made from sticks of candy bars, cans of petrol, old tires, bottles. Depp had a chance to tell a little about the character which gives life in animated film Rango. The collaboration between Johnny Depp and Gore Verbinski started with the films in the series “Pirates of the Caribbean”. When he was asked if are any similarity between Captain Sparrow and Rango, Johnny Depp said that he has always had an affinity for lizards. Depp added that when he played the role of “Jack Sparrow” in the movies “Pirates of the Caribbean and he had to run, that run was inspired from a scene that he saw it live with a lizard that ran on the water.Since than every time when Captain Jack had to ran in the scene he thought and felt like a lizard.Johnny Depp thinks that Gore had in mind that ran of the lizard, which helped to create this character. Rango project is made up by the producer John B. Carls (Open Season), Graham King (The Departed), Verbinski as director and screenwriter, with James Ward Byrkit (who was a concept consultant to the series Pirates of the Caribbean) and John Logan (writter of dramatic films such as Gladiator, The Last Samurai, The Aviator, Sweeney Todd, and future Coriolanus, Hugo Cabret and the next James Bond). Mark “Crash” McCreery, the genius creator of special visual effects, creatures responsible for the series “Pirates of the Caribbean” but also of Jurassic Park and Terminator 2,joined later the team. The movie is awesome and super funny.I recommend it ! Like most movies, the trailers do not add up to the final satisfaction of the movie. My kids stayed awake, but they thought it was average at best. My wife and I fell asleep. Too long a movie. Would have been better had they cut 20 minutes out of it. I went with my 11 year old daughter and se though it was weird. Not only did it not really make much sense but it also wasn’t really that funny. You had to ask yourself what the heck was going more than laughing at the movie. I went to see Rango with my 10 year old and we loved it so much that she asked whether she can see it again and take a couple of her friends with her. We loved the dry humour and the clever use of classical, native American and western music. The animation is superb. The whole film is very fresh and unusual in its better sense of a word. recommend to see it! The strangest, most disturbing,creative movie I’ve seen in a long time ….if ever.Great creatures.Too much for wee ones ,I think.It would have given me nightmares if I were little.But I loved it as an adult.